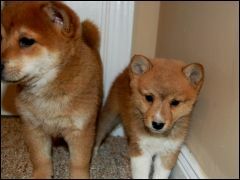 We do not breed adult mini Shiba Inus, they come from regular sized Shiba parents and are not the runt of the litter. 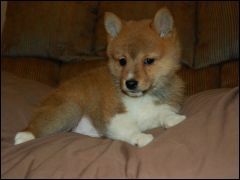 By 3-4 weeks they will be only 2 pounds and by 8 weeks they will be 3-4 pounds. Usually we will keep a mini Shiba Inu longer than an average sized shiba, not letting them go to their new home until 10-14 weeks (smaller litters grow and develop faster). There is no difference in personality or temperament between the mini Shibas and the regular sized Shibas. 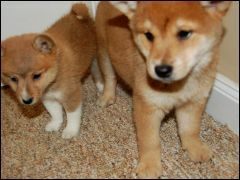 The coat colors of the minis are the same as the standard Shiba Inu: red, red sesame, cream, and black and tan. The red color is the most prominent for the Shibas. 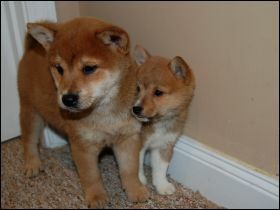 The mini Shibas are just as loving, friendly, smart, and cuddly as their regular sized siblings. The only difference between minis and regular sized Shibas is the size and weight of the dog. Mini Shibas are ideal for people in smaller apartments or smaller living spaces and do not require as much exercise as the regular sized Shibas. In Japan, some animals bred for miniature size are referred to as Mame-Shiba. The prefix "mame," meaning "bean" in Japanese, is similar to "teacup" prefix used to refer to other miniature breeds.